Follistatin (FST) is a secreted glycoprotein that was first identified as a follicle­stimulating hormone inhibiting substance in ovarian follicular fluid (1, 2). Human Follistatin cDNA encodes a 344 amino acid (aa) protein with a 29 aa signal sequence, an N­terminal atypical TGF binding domain, three Follistatin domains that contain EGF­like and kazal­like motifs, and a highly acidic C­terminal tail. Follistatin is a secreted protein that binds to ligands of the TGF-Beta family and regulates their activity by inhibiting their access to signaling receptors. It was originally discovered as activin antagonists whose activity suppresses expression and secretion of the pituitary hormone FSH (follicle stimulating hormone). In addition to being a natural antagonist, follistatin can inhibit the activity of other TGF-Beta ligands including BMP-2,-4,-6,-7, Myostatin, GDF-11, and TGF-Beta1. Follistatin is expressed in the pituitary, ovaries, decidual cells of the endometrium, and in some other tissues. 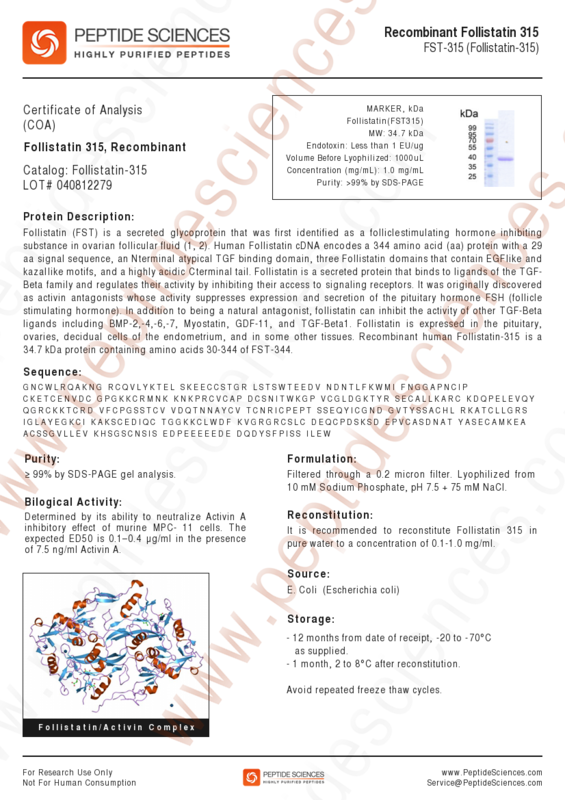 Recombinant human Follistatin 315 is a 34.7 kDa protein containing amino acids 30-344 of the FST-344 protein.